My thanks to Karen Haseldine – who is married to a great-grandnephew of Adeline Wells (nee Columbine) – for her help and advice in compiling this section. and finally her uncle James and his family. The paternal grandfather of Adeline was framework knitter James Columbine who married Ann Goodall at the parish church of Mansfield Woodhouse on December 7th 1812. Their son John was born at Mansfield on July 15th 1823 and baptised at the Wesleyan Methodist Chapel there on August 11th 1823. In the 1832 White’s History, Gazetteer and Directory of Nottinghamshire, James gets a mention as a framework knitter of ‘Ratcliffgate’ in Mansfield and is in the same Directory of 1844 at the same address. James and Ann Columbine continued to live at Mansfield with daughter Ann who married in 1850 to smith and fitter Andrew Valance. Ann Columbine died in December 1864, aged 72, and husband James in 1881, aged 85. On February 20th 1849 and still living at Ratcliffe Gate, John Columbine married Elizabeth Wells at St Peter’s ParishChurch, Mansfield, where his wife had been baptised. She was also a native of Mansfield, the daughter of stone cutter Solomon and Jane (nee Brailsford). In 1851 the couple were living at Back Lane East in Mansfield, with young son, Samuel Webster Columbine, who died in that year, just before the family move to Ilkeston. Webster was a family name, being the maiden name of John’s maternal grandmother, and, like Brailsford, was used quite often within the Columbine family. Even before the move from Mansfield, John had connections with Ilkeston. He often visited the town as a preacher for the day at the Wesleyan Old Cricket Ground chapel off South Street, and would stay overnight at Samuel Carrier’s East Street house, almost opposite the Wine Vaults. After the move from Mansfield, John and Elizabeth had several children, all born in Ilkeston…. John junior, born February 22nd 1852. Elizabeth Adeline, born October 2nd 1854. Lucy Eleanor, born Jan 13th 1857. (died July 6th 1858, of scarlatina). William Brailsford, born April 24th 1859. Martin Webster, born May 21st 1861. Jabez, born Aug 24th 1863, (died May 4th 1865). During this time, John senior was variously described as book-keeper, manager or clerk at a lace factory as well as lacemaker. In the mid 1850’s and still at East Street, he was also advertising his services as agent for William and Henry Sills, stone masons and builders of White Bear Lane in Mansfield, a firm offering ‘the best Mansfield Stone on reasonable terms’. This is the family in 1861 at Carrier’s Buildings in Queens Terrace off South Street. Ten years later the family was at 7 Queen’s Street, now joined by John’s mother-in-law, Jane Wells. John’s work necessitated a move to Nottingham and he makes his first appearance on the electoral register there for the period beginning October 31st 1880, at 10 Ossington Villas off North Sherwood Street. The 1881 Census shows the family at 10 Ossington Villas. Though John senior had left Ilkeston he still owned property there and in May 1883 he tried to sell his six houses in Chapel St East (Lower Chapel Street). They were put up for auction but withdrawn when the bidding failed to go above £800. At that time they were described as occupying 1108 square yards of land, yielding £70 annual rental income. At the same auction John junior also tried to sell five house in the same street — 764 square yards and £58 10s annual rental income — but with the same result. They too were withdrawn .. the bidding did not go above £710. John senior remained on the electoral roll at the same address until 1889 and then returned to Ilkeston to live at 6 Albert Street with his wife Elizabeth. “COLUMBINE – WELLS – Golden Wedding. On February 20th 1849, at St. Peter’s Church, Mansfield, Notts., John Columbine to Elizabeth Wells, both of Mansfield, now residing at Albert-street, Ilkeston”. John died at his Albert Street home on March 3rd, 1906, aged 82. His death was registered by son Martin, then living at Dale Street. He was buried in Nottingham General Cemetery on March 6th 1906, in grave 15749A. Elizabeth Columbine died at the family home on May 13th 1914, aged 91. She was buried with John in the same General Cemetery grave. I, John Columbine, of number 6, Albert Street, Ilkeston in the County of Derby, hereby revoke all Wills and testamentary instruments heretofore by me made and declare this to be my last Will. I appoint my two sons, John Columbine and William Brailsford Columbine, both of the City of Nottingham, (hereinafter called my Trustees) to be the Executers and Trustees of this my Will. I give to my Trustees all my property, consisting of two freehold houses, with appurtenances thereto situate and being numbers 6 & 7 Albert Street, Ilkeston aforesaid and six freehold houses and the appurtenances thereto situate and being 33, 34, 35, 36, 37 and 38 Chapel Street, Ilkeston aforesaid. Upon trust to receive the rents and income thereof and with and out of such rents and income to pay all my funeral and testamentary expenses and debts and the interest due and to become due on any mortgage existing on my said properties at the time of my decease. And to pay all expenses necessary for keeping such property in repair and fit for habitation and after such payments as aforesaid to pay the residue of such rents and income to my wife Elizabeth during her life. And I direct my trustees to allow my said wife Elizabeth, during her life, the use of my household furniture and effects in and about my residence at the time of my decease. And immediately after the death of my said wife Elizabeth, I direct my Trustees to sell the whole of my before mentioned freehold property and the said household furniture and effects and with and out of such proceeds of sale to pay off the mortgage held on the before mentioned six houses in Chapel Street, Ilkeston aforesaid by Mr H Thorpe solicitor Market Street Ilkeston and also to pay off the overdraft of one hundred pounds sterling (£100) and interest on the same, had by the firm of J & C Columbine of Albert Street, Ilkeston aforesaid from the Nottingham Joint Stock Bank Limited of Ilkeston, on the security of the deeds of my two houses in Albert Street, Ilkeston aforesaid. And in case the before mentioned overdraft and interest shall amount to one fourth or more than one fourth of the proceeds of the sale of my property, then I direct my Trustees to pay the remainder of the proceeds of the sale of my property to my two sons the said John columbine and William Brailsford Columbine and my daughter Elizabeth Adeline Wells, the wife of William Alfred Wells, of number 34 St Johns Mill Road, Eastbourne in equal shares. But in case the before mentioned overdraft and interest shall amount to less than one fourth part of the proceeds of the sale of my property then I direct my trustees to pay the difference between the amount of the before mentioned overdraft and interest and the amount of one fourth part of the proceeds of the sale of my property to my son Martin Webster Columbine of number 4 Stanley Street, Ilkeston aforesaid in fortnightly instalments of Two pounds sterling (£2). And I direct my Trustees to pay the remainder of the proceeds of the sale of my property to my two sons the said John Columbine and William Brailsford Columbine and my daughter the said Elizabeth Adeline Wells in equal shares And in case of the death of any of my said four children, before the execution of this my Will, the deceased’s share shall belong to the deceased’s lawful issue share and share alike. In witness whereof, I have hereto set my hand to this my Will, this first day of April One thousand, nine hundred and four. Signed by the said John Columbine, the Testator, as and for his last Will and Testament, in the presence of us both present at the same time, who in his presence at his request and in the presence of each other have hereunto subscribed our names as witnesses. It was from 10 Ossington Villas, on her birthday in 1886, that daughter Elizabeth Adeline Columbine married William Alfred Wells, cabinet maker of 32 Skynner St, Nottingham, at Holy Trinity Church, Nottingham. The couple remained at Ossington Villas where son Alfred Percy was born in 1887. ……. and were still there until 1896. In 1901 the family was at 34 Mill Road, Eastbourne…. On the 1911 Census, at 34 Mill Road, Eastbourne…. The census also records that Adeline had been married for 24 years and had one other child who had died. In 1904 son Alfred Percy gained success as an external student for the University of London in the Intermediate Examination in Science, being placed in the First Division. And then this, from the Sussex Agricultural Express, Nov 19th 1909…. ‘In connection with the scholarship system maintained by the (Education) committee (of East Sussex), the attention of the council is directed to the following success, viz — Alfred Percy Wells, who holds a major scholarship, took his degree at Cambridge, being placed 54th in the Honours list of the Mathematical Tripos’. GOLDEN WEDDING – Columbine – Wells – On Oct 2nd 1886, at Holy Trinity Church, Nottingham by the Rev W R Blackett, Vicar, Elizabeth Adeline, only daughter of Mr John Columbine, of 10, Ossington Villas, Sherwood Street, Nottingham, lace manufacturer to William Alfred, second son of Mr George Wells, farmer, Pinchbeck Marsh, nr Spalding. Present address West Bank, Mill Road, Eastbourne. (My thanks to John A Goulder who spotted this and sent it on to me). Elizabeth Adeline Wells died at Eastbourne on August 4th, 1944, aged 89. She was then still living at West Bank, 34 Mill Road, her residence for over 40 years, and was killed in a road accident at the junction of Terminus Road and Langney Road. It was Friday and Adeline had left her husband at 2.15pm in Cornfield Road to go to the Picturedome cinema in Langney Road. She was about to see Walt Disney’s ‘Snow White and the Seven Dwarfs’, which the cinema had obtained for part of the school holidays, and stayed to see the support ’feature’, the musical ’Nobody’s Darling’. Coming out of the building just after 5pm, Adeline stepped off the pavement in front of an R.A.F. lorry driven by L.A.C.W. (Leading Aircraftwoman) Patricia Lewis, a member of the Women’s Auxiliary Air Force. Despite braking and swerving, the lorry hit Adeline, causing severe and fatal injuries to her head and chest. At the inquest on the following day it was reported that death ‘must have been instantaneous’, and a verdict of ‘Accidental death’ was recorded, no blame being attached to the driver of the vehicle. Adeline was buried at Ocklynge Cemetery in Eastbourne, at 11am on Thursday, August 10th. In her will she left nearly £4000 to her husband, now an Inspector of Weights and Measures with the Eastbourne Corporation, and to her schoolmaster son. (My thanks to the staff at Eastbourne Central Library, especially Dhimati Acharya, Sammi Hyde and Sarah Kyne, for supplying the information surrounding Adeline’s accident and death). Her husband William Alfred died on February 7th 1953 at Eastbourne, aged 93. Their son Alfred Percy married Muriel Ethel Mellersh of Fulham in 1918. By 1939 the family had moved to Royal Tunbridge Wells where Alfred Percy was employed as an assistant schoolmaster. And the other children of John and Elizabeth Columbine? Like his father, John junior also left Ilkeston for Nottingham and there he married Mary Elizabeth Toon in 1879. She was the daughter of whitesmith Thomas and Eliza (nee Clarke). In her definitive study of the East Midlands lace industry, Sheila Mason states that the Bath Street industrial complex of Henry Carrier & Sons was taken over by John Columbine junior in 1902 and thenceforward concentrated on hosiery. All his working life William Brailsford Columbine was connected with the hosiery trade. At Nottingham on August 1st 1876, he married Fanny Claringburn, daughter of Nottingham framesmith Joseph Augustus and Martha (nee Peet). The couple lived in Bromley Place in Nottingham, where William was a warehouseman. Their children, Ernest Oswald, Harold Brailsford, Minnie Adeline and Edith Frances, were born in the city. From 1891 to 1908 the family was at 14 Curzon Street in Nottingham. The family then moved back to Ilkeston to live at Ingleside in Field Road, (telephone Ilkeston 141). !! In 1904 William took over the business of Henry Carrier & Sons Ltd, hosiery manufacturers of Bath Street, and up to the time of his death he was its owner and also Managing Director. From the New York Times of February 22nd 1916…..
Fanny died at the family home of Ingleside in Field Road on February 23rd 1921, aged 66, and on December 12th of the following year William Brailsford married his second wife, Florence Barrowcliffe, daughter of lacemaker James and Alice Hannah (nee Keightley). Suffering a recent bout of acute bronchitis, William Brailsford died at Ingleside in December 1937, aged 78. The Advertiser described him as a generous supporter of good causes in Ilkeston. He was ‘a man of more than ordinary intellectual gifts’ and ‘will be greatly missed by many whom he has helped in various ways’. In an obituary article the newspaper added a little detail about his personal beliefs. “From early years he had held distinct views on religious matters and found himself unable to support the doctrines of Christianity and the Bible. A great reader and an able writer, he expressed his views in copious contributions for many years to daily and weekly papers over the familiar signature A.X.E., the identity of the writer being unknown to multitudes until it was revealed by his death”. “He was almost the only man I have ever known who was consistent in every opinion he held. For many years he seemed to have retired from public writing, but he suddenly re-appeared and gave to the readers of the ‘Journal’ work equal to anything he had written in his past. His last letters were, I thought, about the possibility or probability of a future life in which his position was a dead negative. He has gone now to the place of the dead according to his own creed, and to the living according to mine. I hope his realisation is what I hope for him and not what he himself anticipated, for a man so worthy and conscientious deserved the best which the Creator has in store for humanity”. Sir, — It was with something of a shock that I read in a recent issue of a London paper an announcement of the death on December 5th of Mr. Columbine. He was a very remarkable man, and, as a fellow-Ilkestonian and old friend – probably the oldest – I should like to pay a tribute to his memory. I first made Mr. Columbine’s acquaintance nearly 60 years ago when, as a boy fresh from school, I entered the service of a firm whose warehouse was in Nottingham. Mr. Columbine, who was then about 19 years of age, had already been there for several years. I was placed straight under his charge, and for six years — until I removed to London – he was not only my office superior, but my “guide, philosopher and friend”. Even at that distant date I soon discovered that his real interest in life was not the making of money in business but the war against superstition and the advocacy of the principles of materialism. Charles Bradlaugh was then, and has remained through life, his ideal. To these principles and this ideal Mr. Columbine had adhered with unswerving consistency throughout his long career. Incidentally, he soon converted me – a descendant of a long line of Calvinistic Baptists – to his views on orthodox or any other formulated religion, although he always failed to convince me that body and soul are one entity and that nothing survives for the individual after death. His own consistency is shown by the fact that as recently as May last he wrote me the longest letters I have ever had from him, all arguing in support of his life-long creed. And lies down to pleasant dreams”. Wikipedia defines Freethought as ‘a philosophical viewpoint that holds that opinions should be formed on the basis of science, logic, and reason, and should not be influenced by authority, tradition, or any other dogma’, especially in religion. In 1860 Charles Bradlaugh helped form the journal the ‘National Reformer’, based on atheistic Secularism, and speaking out on such issues as universal suffrage, contraception and republicanism. He then helped found the National Secular Society in 1866. Prime Minister from 1902 to 1905, Arthur James Balfour was also a renowned philosopher who, in 1879, wrote ‘A Defence of Philosophical Doubt’. William Brailsford wrote his critical examination of Mr. Balfour’s Apologetics in 1902. The letter’s first two lines of poetry are taken (not with total accuracy) from Warwick-born writer William Savage Landor’s work ‘On His Seventy-fifth Birthday’ (1849). The letter’s last two lines of verse are the last two lines of the poem ‘Thanatopsis’ (meditation upon death), written in its final form in 1821 by American poet William Cullen Bryant. William Brailsford’s estate, with a gross value of £55,131 12s 6d, was inherited by his widow and surviving children. He was cremated at Wilford Hill Crematorium in West Bridgford. 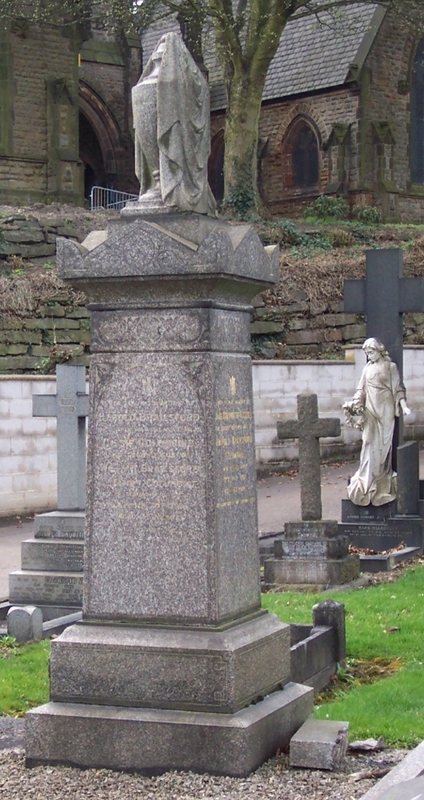 A large memorial column stands in Park Cemetery in his memory as well as that of his first wife Fanny, their son Harold Brailsford Columbine and Harold’s wife Jane Charlotte (Cissie). Martin Webster Columbine married Catherine Mary Giles at Lowdham on June 2nd 1883 and for a time remained at Nottingham, where daughter Ethel Gertrude was born in 1884 and son Arnold Martin in 1887. In the late 1880’s he returned to Ilkeston to live at 7 Albert Street. A long-time sufferer of anaemia, Martin died at his Albert Street home on November 15th 1914, aged 53. He was buried at Nottingham General Cemetery three days later. Catherine died on February 19th 1926, aged 67, at the same address. This photograph is mounted on card, on the reverse of which is a chart showing the names of some of the subjects. There is also a separate set of notes on the subjects. Both were compiled by Kathleen Riley, later Cox, nee Haseldine, the great grand-daughter of John Columbine senior and thus the grandniece of Elizabeth Adeline. 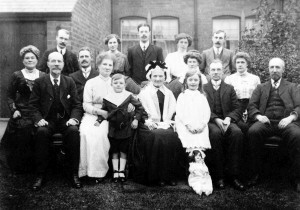 Front row centre, flanked by the two children, is Elizabeth Columbine (nee Wells), widow of John senior. Seated to her right is her daughter Elizabeth Adeline Wells (nee Columbine). And to Adeline’s right is her brother William Brailsford Columbine. On the extreme right of the photograph is the youngest son, Martin Webster Columbine. (The remaining adult on the front row, between Elizabeth and Martin Webster, is unnamed. Could this be John Columbine junior, the eldest son of John and Elizabeth?). On the second row, from left to right, are ..
Fanny Columbine (nee Claringburn), wife of William Brailsford Columbine. William Alfred (‘Alf’) Wells, husband of Elizabeth Adeline. Minnie Adeline Harvey (nee Columbine), wife of Frederick Harvey and elder daughter of William Brailsford and Fanny Columbine. Catherine Mary (‘Kate’) Columbine (nee Giles), wife of Martin Webster Columbine. Harold Brailsford Columbine, younger son of William Brailsford and Fanny. Edith Frances Columbine, younger daughter of William Brailsford and Fanny. Alfred Percy Wells, son of William Alfred and Elizabeth Adeline. Jane Charlotte (‘Cissie’) Columbine (nee Goodall), wife of Harold Brailsford. or Frederick Harvey, husband of Minnie Adeline (nee Columbine). The children are Harold Frederick Harvey, son of Frederick and Minnie Adeline, and Minnie Edith Columbine, daughter of Harold Brailsford and Jane Charlotte. By her feet is Minnie’s dolly (name unknown). Uncle James Columbine and family. James Columbine junior, the older brother of John, was born about 1820 in Mansfield. He married Sarah Percival, (the illegitimate daughter of Elizabeth?) at Mansfield Unitarian Chapel in 1846. Like his father, James junior was a framework knitter and continued to live in Ratcliffe Gate, Mansfield after his marriage. Several of his children were born there until the family moved to Ilkeston in the mid-1850s, where daughter Sarah was born in November 1857. She was followed by Rebecca (1860), Herbert (1862), Martha (1865) and Eliza Ann (1866). There were at least nine children in the family. Saturday, June 29th, 1878, at the Columbine home in Awsworth Road … and just after 3 o’clock in the morning James awoke … (was that his daughter shouting to him??) … to find that his wife was not in the bedroom. In the recent past Sarah had twice been temporarily housed as a patient into the Mickleover Lunatic Asylum. And in the last weeks her mind had been greatly troubled. James dressed and hurried downstairs. A quick search around the house revealed nothing before James went out the back and saw that the stone lid covering the soft water cistern had been removed. As the lacemaker moved towards it he saw the body of Sarah, wearing only a skirt and chemise, lying in the water, face downwards, quite dead. At the inquest held at the Commercial Inn in Awsworth Road on the same day, it was revealed that Sarah had previously threatened to drown herself. The inquest jury returned a verdict of ‘found drowned in a cistern of water .. temporary insanity’. The incident was reported in the Pioneer as well as several other local newspapers (the Derby Mercury and Nottinghamshire Guardian for example) and further afield. James continued to live in Ilkeston and died at 36 Abbey Street on February 15th, 1894, aged 73. At that time he was living with his daughter Sarah and her family. She had married in May 1875 to Ilkeston coalminer John Stevenson, eldest son of miner Joseph and Sarah (nee Scattergood). Another of his daughters — Mary Columbine — married George Wake Beardsley on Christmas Day 1874. He was the illegitimate son of John Wombell, printer and editor of the Ilkeston Pioneer, and Maria Beardsley.